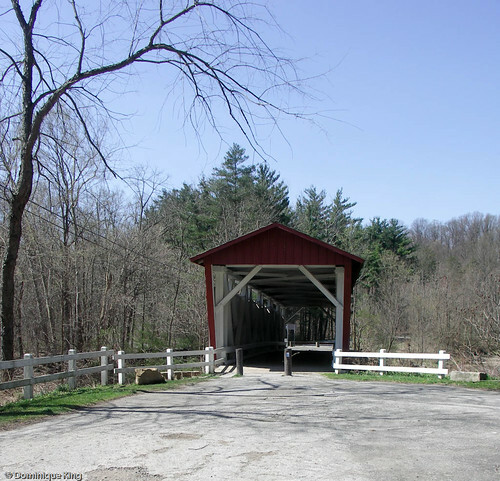 Is Ohio's Everett Road Covered Bridge haunted? This pastoral scene of horseback riders and Ohio's Everett Road Covered Bridge may look serene by the light of day, but nighttime brings a more unsettling experience for the bridge's nocturnal visitors. 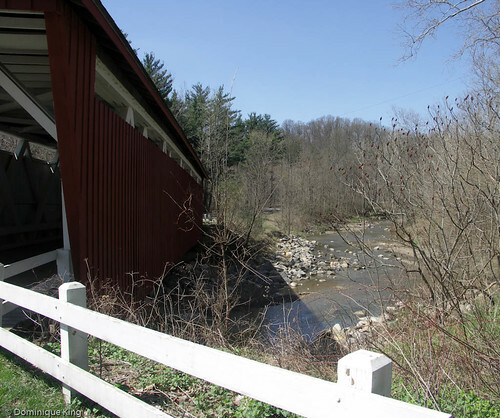 Covered bridges were particularly prevalent in Ohio's early history. 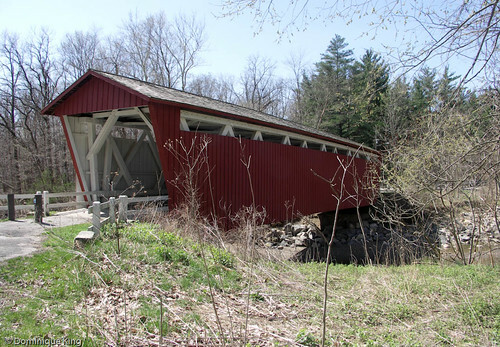 The first covered bridge appeared in Ohio in 1809, and the state had over 2,000 covered bridges in the 19th century according to a National Park Service sign we saw near the bridge. The Everett Road bridge is the last remaining covered bridge in Summit County (south of Cleveland and near Akron), and the lonely bridge apparently has at least few otherworldly stories to tell. Mystery shrouds the construction of the bridge spanning Furnace Creek in the Cuyahoga Valley National Park. Farmer John Gilson and his wife went out to visit friends one winter night in 1877, but found fording Furnace Creek to get back home especially treacherous because a winter storm caused rising water and ice to block their regular route. The couple used an unfamiliar crossing, with farmer Gilson leading the horses across the stream. Mr. Gilson and the horses lost their footing, Mrs. Gilson fell into the water (presumably from a wagon drawn by the horses), and the horses' weight dragged Mr. Gilson into deep water. Mrs. Gilson survived the accident. Mr. Gilson did not, with his body discovered a few days after the tragedy. Some stories date building of the Everett Road covered bridge as following the Gilson accident, and as a response to farmer Gilson's death. 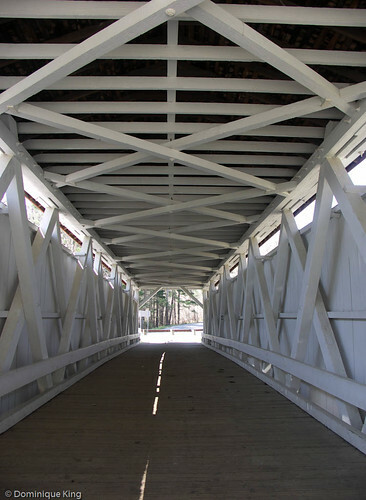 There are no records confirming the bridge's construction date, but the bridge's truss style (patented by Robert Smith in the late 1860s) and the fact that few wooden bridges were built after iron became popular for bridge construction by the 1880s, suggests a construction date not too long before, or after, the accident. The construction of Everett Road in 1856 yields an even earlier spooky story. Road construction workers found a burial mound during their work. The hexagonal limestone-block-lined tomb contained skeletal remains and some Native American items belonging to the Hopewell Culture. Hopewell Culture refers to ancient native civilizations in Ohio and other areas in eastern North America primarily 1500 to 2100 years ago, and Ohio has several significant mounds and other earthworks attributed to these peoples. The bridge builders of the 1850s had no real concern for the historical significance of their find and politely built their bridge over part of the burial mound. Many nights, a ghostly hitchhiker reportedly lurks along the road between the native burial site and the covered bridge. One Cleveland-area couple conducted several investigations at the bridge and at nearby burial places. They detected supernatural activity on several occasions, documenting their findings in photos and audio tape. Their photos show numerous orbs and fogs in and near the bridge, and the audio supposedly reveals electronic voice phenomena (paranormal sounds resembling human speech). Did the ghost hunters hear someone saying "help me" or "danger" while visiting the apparently deserted bridge at night? We visited the bridge one sunny spring day, unaware of its spooky past. Horseback riders were out enjoying the day on a nearby bridle trail, and we wandered all around the bridge taking photos without sensing a hint of the supernatural. Is the Everett Road Covered Bridge haunted? I sure don't know, but I thought the spooky stories surrounding the bridge merited retelling this Halloween season! My name is Rich Hughes and in 1986 I was a 27 year old Civil Engineer whom designed the bridge you see today. I remember working with the Park Service who instead of contracting the project out for construction elected to used in house new recruits to physically build it by hand. James Askins was the foreman for the park service whom worked out of Williamsport Md. The men and women whom built the bridge were from all walks of life with degrees in accounting, business, and the arts. I made many trips to the site to show them how to make the joints and put the camber (arch) in the bridge. Instead of building it in place we built the main trusses on the one bank and then flipped them vertical and into place using a crane. As I recall the bridge was swept to a bank in the 1972 flood and local kids raised money for the bridge rebuilding but the project lost steam and the monies lay in a bank account. The elementary kids grew up moved on and then someone asked the question, "what happened to the money we raised as kids?" The money was found and the students who were now in their 20's were brought back into the project. I remember that the ruins of the original bridge lay rotten on the bank but I had a great photo of the bridge which I used for the reconstruction. The main timbers were trucked in from Oregon. I was only able to use one diagonal from the original bridge. We purposely made the webs of the trusses random sizes so to be accurate. Instead of white paint we used white wash lime. The day we swung the two main trusses into place a large crowd was present including a film crew from an Akron TV station who interveiwed me. I was unable to be present for the dedication but I was told that Sen John Glenn was present. I went on to design over 100 bridges including one over the Nile in Africa but this one is very special to me and photos hang on my office wall. Rich-Thank you so much for stopping by and sharing the story of your involvement with the 1980s reconstruction. I've always found bridges fascinating, and I particularly enjoy learning their stories as I photograph them and write about them. This is such a beautiful bridge, the story of the people who helped design, fund, and build it shows that so many people cared about creating something that the rest of us could enjoy for years to come. I thank all of you for that. I've investigated the bridge off and on since I first heard about it back in 1998. I've never heard the wagon or captured anything interesting at the site (though a friend did photograph what could be a faint, phantom horse in the creek), but I did turn up a lot of interesting history. The park service did get their history wrong with Gilson. According to the actual newspaper report, his sleigh slid into the creek along Wheatley Road further north of the site. His body was recovered four days later in the creek past the bridge. According to a historian I spoke with in Peninsula, it was called Centennial Bridge, so it was likely built in 1876. I checked over the paranormal investigation site (I wonder if they realize Gilson and his wife Hannah are both buried at Ira Cemetery), and there's just one problem with it. They claim the abandoned cemetery is in a wooded area beside the bridge. It sounds like they're placing it along Oak Hill Road on the southwest side of the bridge. They were in the wrong location completely. The cemetery, abandoned in the 1890s, was north of the bridge. All that remains are pine trees along Everett Road. The valley is filled with bizarre history and spooky stories. Hopefully I'll be correcting many of the errors in the stories I published in the book next year when a new revised version is released by a real publisher with the help of a fellow investigator and researcher. Ken-Thanks for stopping by and sharing some of the results of your research with me. I love these old stories, but it's often tough to get what feels like a reasonably accurate story sometimes.